Dual lead worm gears, as their name suggests, are constructed with two leads. One flank of the worm thread and its mating sides of the wheel teeth are manufactured with one lead, and the other flank and its mating wheel teeth to a slightly different lead. As far as the worm is concerned this had the effect of producing a worm thread which increases in thickness from one end of the worm to the other. If the worm is therefore moved in an axial direction when in mesh with the wormwheel, backlash between the pair can be adjusted to the required amount. 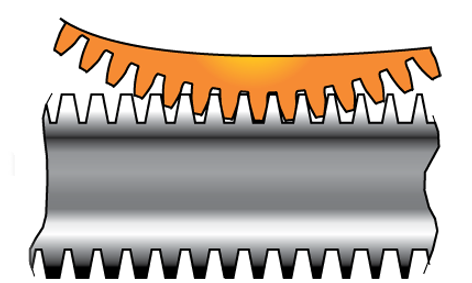 In practice, the gears are manufactured so that the initial back lash is achieved at a certain distance relative to the datum plane on the worm. The worm can then be adjusted from this point as and when necessary during the life of the gears. Method The dual Lead worm gear does not suffer from any of the split type disadvantaes. It provides a kinematically correct gear, which can run in either direction of rotation and on which the backlash is infinitely adjustable from an acceptable maximum to zero. 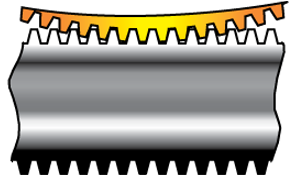 In addition, the dual lead wormshaft is one-piece unit that is more accurate than split worms With this arrangement the worm is produced as a two-piece item, the design being split at the gearing centerline. One worm may be integral with the shaft, the other keyed or splined to the shaft but axially adjustable, the position being fixed by a spacer positioned at the centerline between the two components. There are a number of disadvantages with this method. Firstly, the gap required by the spacer can cause an interruption of the line of contact. Secondly there will be increased friction and therefore reduction in efficiency due to the applied pressure to both sides of the wormwheel teeth. Diameter pitch circle Uses an oversize diameter pitch circle resulting in reduced pressure on the contact surface.